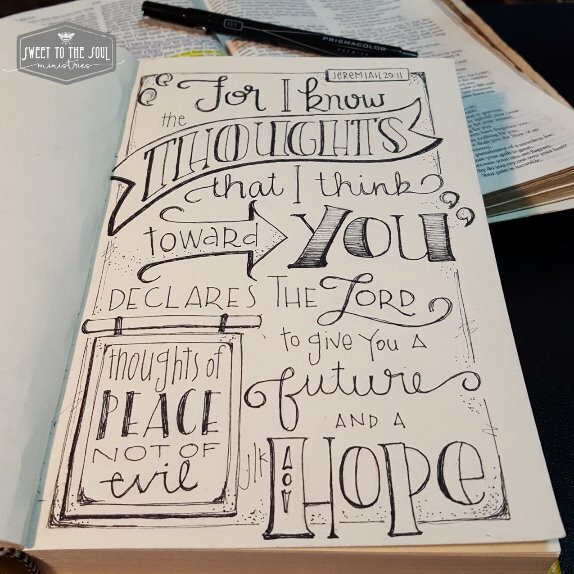 Jeremiah chapter 29 verse 11, a scripture we probably all know, but most likely recite differently from above; other translations begin with “For I know the plans I have for you…”. This may be the most used scripture for graduates or anyone embarking on a new venture, new plans. But when I read Jeremiah 29:11 this week in the King James Version, the words seem to leap off the pages and dance with new meaning for me. And even though I am crossing over into a new season full of fresh unknown adventure, God “knowing the plans for me” was not the revelation. New for me was: God. Thinks. About. Me. Ok, does this not just reach down and grab you at your core to realize that the God of all creation is thinking about you and me? Oh yes Lord, comfort and calm my insecurities and anxious mind! ​Let me set up for you what was going on at the time Jeremiah gave us what would end up being one of the most quoted scriptures in the Bible. Now, I cannot even imagine being in that situation, but I have found myself suddenly thrust into unknown and often unfriendly territory as life’s circumstances uprooted me from my familiar, warm and cozy comfort zone. Maybe you have been there also. Maybe you are there right now. That’s where the Jews found themselves. So to offer His chosen people comfort and reassurance, God has Jeremiah write a letter to the captive elders. This time is from God. ​Right off the bat, Jeremiah lets the Jews know that God is not only fully aware of their situation; it didn’t even surprise Him because He orchestrated it. God is in control friends. And there is nothing that comes our way that catches God off guard. Every situation in our lives passes through His hands and is orchestrated to bring about a specific result to accomplish a specific purpose. ​This time is going to last awhile. Welcome to your new normal, make yourself comfortable. I have a friend who is moving in to her new normal as a widowed mother of two. My mother is trying to adjust to her new normal of increased physical limitations due to declining health. My new normal is soon to be discovered just around the corner. Are you facing a new normal? This time will not be resolved by others. ​Can I just admit in this safe place that I like to be in control? Something shifts and circumstances change and I want to fix it. I want to find a solution, correct the issue and get back to normal. And it sounds like God’s chosen people were a bit the same because Jeremiah is passing along God’s message for them to not seek out other solutions for their situation. And to beware of those saying they have a solution because they do not. God is very specific in saying that He is the only solution. ​This time will bring a divine solution. I tend to think I’m a “glass is half full” kind of gal, I try to look for the positive in most situations; I try to ‘believe the best before I assume the worst*’. But when my happy gets bumped too hard and things begin to look bleak, it becomes tempting to focus on the negative and to fear the worst. Or I might conceive the outcome that I desire, including wanting my new normal to get back to my old normal and quickly. But God already has an end solution in mind. In fact, God’s solution was formed at the same time the situation was instigated. God’s expected end is to work something good in our life, to work something good for His Kingdom. Am I resting in the confidence that God is in control or am I anxiously trying to control the situation? Am I trusting God’s faithfulness or am I whining and complaining about the situation? Am I seeking answers from any means other than God? Am I exercising faith in believing God will work my situation for good? I have to admit that I am thankful to God for the lessons He is teaching me from His scriptures. They are not random. They are not coincidence. God is faithful to meet us right where we are and to meet our needs. I have a new normal on the horizon. I don’t really know what it will be like. In some ways, I feel it might be less than this now normal, yet in other ways I know it will be so much more. So I am waiting with expectant anticipation as each day passes and I come 24 hours closer to a brand new normal. ​This post is part of our new series #SoulInspired. I love your commentary on Jeremiah 29:11, how you give the context and also link it with our lives. This is good Bible study! Oh yes, I'm breathing in deep myself and asking God for grace to embrace the new normal that awaits me around the bend too! Jana, this is such a timely post for me. I know God lined us up beside one another over at Holly's link-up. Thank you for your wisdom here, God has surely given you a talent for understanding scripture. Just love how God orchestrates every single detail for us! So blessed to be linkup neighbors! I can honestly say I've never read this verse in the KJV and wow, what a difference I get from the words and the meaning. I love how different translations can bring the Word to life in a new way. Thank you for reminding me that even in times of waiting I can still grow and fulfill the plans God has for me. Lovely post, Jana. Thank you Abby for your kind words. I love reading scripture in different translations also. God is so wonderful to always speak to me thru His word. I have been getting ready for changes in my life...and coming around to accepting them. This was good for me to read this morning. Thank you for this.Am going thru a situation& at times, I wish for my old life,not this uncertainty & not knowing.One thing am learning is that trusting God is all I have.The experience am going thru made me turn back to God,as he's the only one that can.& he has given me peace,& the promise that he's always with me& nothing catches him by surprise,which is what I treasure & need most. Babra, I am praying for God to surround you at this time and make His presence known like never before. Change can be scary, but God is so faithful. We just have to step out in faith. Celebrating your new closeness with the Lord and the peace He has brought upon your life. Thank you Lord for having a plan for my life in Jesus name and that it's for my good.